Congregation Sukkat Shalom is home to more than 35 families and is the center for Jewish life in Southeast Alaska. While we do not have a full-time rabbi in Juneau, we are fortunate enough to host student rabbi each year on a monthly basis. Recently we welcomed Jeff Dreifus to Juneau, and are excited that he will be part of our community for the upcoming year! Jeff grew up in Memphis, Tennessee and as a kid, went to a Jewish summer camp in Mississippi and was active in BBYO and NFTY. Jeff then went to Washington University in St. Louis, where he majored in Economics and Environmental Studies. After college, Jeff worked in investment banking and for an early-stage energy efficiency company for five years in Memphis before deciding to become a rabbi. 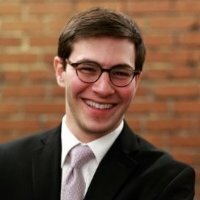 After college, he also co-founded a fellowship (www.tifellowship.org) that brings Jewish college students to Memphis for the summer for internships, professional development, and Jewish community building, and co-founded monthly a Shabbat service for Jewish young adults. Jeff spent the past year studying in Jerusalem for his first year at HUC, and this summer served as Director of Jewish Life for the Union for Reform Judaism Jacobs Camp (where he grew up) in Mississippi. Jeff is currently studying at HUC’s Los Angeles campus and in his free time, he loves to go camping and hiking with his dog, Abbey Road.